“ARCHETYPE ,” (2013) Paper and pencil. 50 x 102 centimeters. Courtesy the artist. “ARCHITECTURE odessa [Kleybs Profitable House],” (2013). Paper and Pencil. 60 x 81 centimeters. Courtesy the artist. 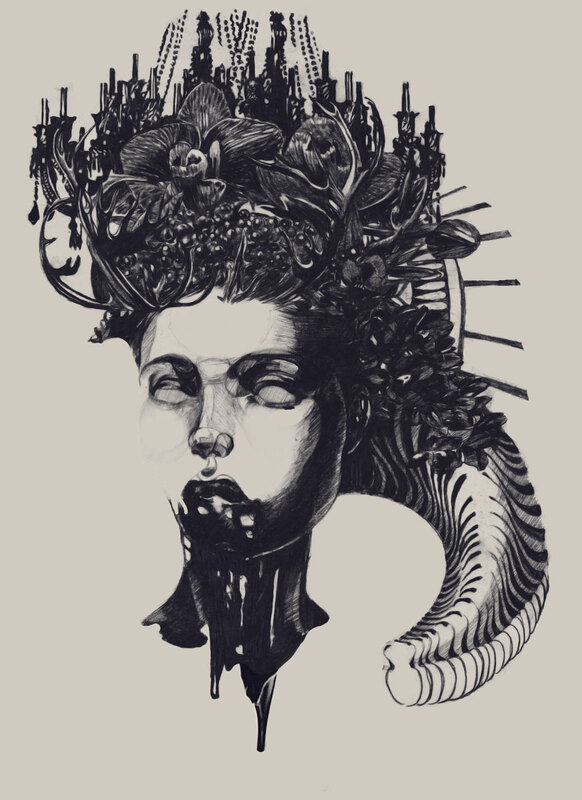 “ARCHETYPE ,” (2013). Paper and pencil. 70 x 96 centimeters. Courtesy the artist. The Black Sea, and its anoxic deeps, form a meromictic cocktail too hostile for many biological organisms to survive, thus preserving everything it swallows—ancient ceramics, Byzantine shipwrecks, dead bodies. The sea itself evokes images of historical violence, mythic warfare, swell detonating against swell beneath a funereal sky of hemorrhaging storm clouds. Along the northwestern shore of this strange, landlocked waterway stands Odessa, the third largest city in Ukraine. This is the home of artist Dasha Pliska. Dasha is pretty and slight, with ink-drop eyes and long dark hair, a passionate defender of animal rights. Her Elements collection showcases beautiful and heart-wrenching illustrations of animals literally bound to the instruments of their distress—an owl tied to a cage, a fish to a hook and a rabbit to a pair of scissors. “I can’t understand why people believe that they are somehow superior to the animals and have the right to exploit nature,” she tells me. And looking at her work you find yourself empathizing with the subjects. You feel, somehow, that the faculties in an owl could be a thousand times more refined than the faculties in a man, that perhaps an old dog has a greater understanding of mortality than we do, referencing his circadian clock the way we check our wrist watch. And this is what artwork is supposed to accomplish: to change the way we feel about a thing or an idea, to suffuse a culture with ideological disorder, to shift the human heart. When tragedy strikes and the rest of us are gathered at shop windows watching the televised collapse, the artist is figuring out a way to translate our misery and loss into something meaningful. They know that the anthem of one nation is the swan song of another. But Dasha Pliska doesn’t subscribe to one overarching theme. 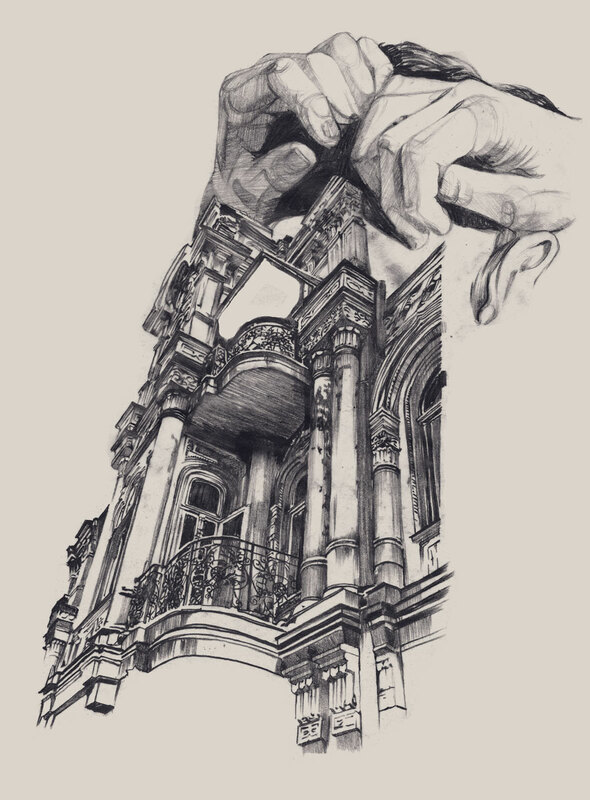 Her work is more personal, subtly subversive, quietly addressing issues like the degradation of Odessa’s beloved Classicist and Renaissance architecture. She explains that the city “becomes faceless without these buildings,” and that “city government almost does not care about saving the uniqueness of Odessa.” The illustrations in this series, which feature pairs of hands integrated into, or embracing these magnificent buildings, are a historical lament, an aria to the loss of intimacy between humans and the structures we build around ourselves. Although she would never admit this (“I’m not sure of my talent even in the drawing area”), the scope of Pliska’s artistic talent seems boundless. She’s “tried all areas of fine art, ranging from sculptures and crafts and ending with the interior design and wall art,” and has now partnered with her friend and fellow designer LIMB MINT to create a line of minimalist clothing and accessories befit for some post-apocalyptic dreamscape. “Yes, I like fashion,” she says, before mentioning Damir Doma, Maison Martin Margiela, and Ukrainian designer Konstantin Kofta. So, Dasha Pliska, the lovely woman from Illichivsk, will continue to create unspeakably beautiful works of art, and she will do it humbly. This is Odessa, the exotic city she calls home. And this is the Black Sea, mysterious and inspiring. And here are the dead therein, preserved and waiting.